The new Administration’s focus on creating domestic jobs, in addition to a potential reset in American defense and security alliances abroad, has generated significant uncertainty regarding US A&D export opportunities. 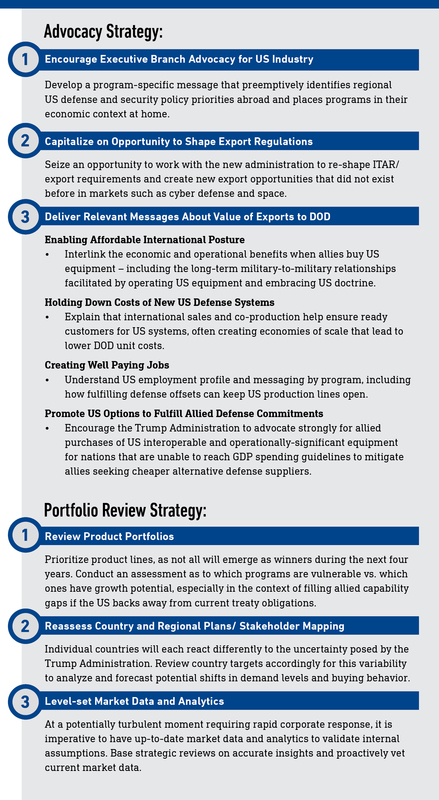 For US defense firms looking to capture opportunity and mitigate risk, Avascent recommends a two-pronged strategy focused on: 1) Messaging to US Executive/DoD leadership to shape their advocacy and 2) Reviewing global business portfolios. For the past six years, the US defense industry focused on exports as part of a larger globalizing trend that often saw major international deals contingent on sharing technology and significant work with foreign customers. With a reinvigorated focus on adding domestic jobs and a potential reset in American defense and security relationships in Europe and Asia, the Trump Administration may portend significant changes for industry export strategies. It is hard to overstate the importance that international military sales have assumed in US defense firms’ growth plans – and how hard-fought those deals are. US defense exports reached nearly $38 billion in 2016, and in both 2015 and 2016, exports constituted over 20% of US defense firms’ total sales. As an indicator of how A&D executives view international expansion, a 2016 Avascent survey revealed 91% expected exports to grow in importance – all in an increasingly competitive market including not only other US firms but new challengers such as China, India, Brazil, South Korea and more. At the same time, only 6% of executives felt their company was prepared to meet the challenges associated with growing reliance on international exports and increasing offset requirements. Based on public statements, testimony and policy plans from Trump Administration officials and the President himself, three priorities emerge with direct relevance to export-focused defense firms trying to navigate this new environment. The first is strategic: ensure the United States has the conventional and nuclear forces for its self-defense. The second is as much political as economic, and therefore of crucial importance for defense companies grappling with a globalizing market: protecting and creating defense industrial jobs for American workers. The third aims squarely at the bottom line of defense firms: driving down military hardware costs to the Defense Department, perhaps through a zero-sum game approach that prioritizes price over value. At home, these policies have merged ambitious Trump Administration spending plans such as a 350+ ship Navy with an unprecedented willingness to insert itself into some of the largest and most politically sensitive Pentagon procurement programs. Well before Inauguration Day, the President-elect took shots via Twitter at the Air Force One replacement aircraft and F-35 Joint Strike Fighter programs. Simultaneously, the new Administration has signaled a sea change in defense and security policies with America’s allies. Nowhere is this more apparent than with Europe, which has repeatedly seen President Trump sow doubt about the nature of the United States’ relationship with NATO. As recently as January 16, he called the alliance “obsolete” and cast doubts on America’s commitment to the 68-year old alliance because most of the member states, year after year, fail to meet NATO’s 2% GDP spending guideline. As many NATO member nations are significant buyers of US-origin defense equipment, including the F-35, American contractors could find themselves entangled in a transatlantic political knot. They may be caught between domestic political pressure directly from the White House and contractual obligations to European industrial partners. Add in the Brexit shuffle of the European defense ecosystem and it appears many of 2016’s bedrock assumptions may not survive this year. The Trump Administration’s early focus on the F-35 may be telling, because the program reflects the current reality of the defense market in that customer nations want to ensure they derive jobs and technical advances when they sign on to buy major US defense platforms. The F-35 program counts jobs in 45 US states with estimated direct or indirect employment of 146,000 US workers. It also involves nine foreign partners, who are carrying a significant amount of the development cost and supplying components on every jet built. Consider Italy, which is expected to see nearly $10 billion in production work from the program in the coming decades. Italy also has Europe’s only assembly facility in Cameri. (Another final assembly plant is in Japan.) If the Trump Administration seeks to alter these international partnering arrangements, the entire F-35 program may be placed at risk. To the extent that US companies face political pushback to sharing such high-touch labor on future programs, they will be at a disadvantage in upcoming foreign deals. And current offset obligations could become a liability in the eyes of the White House. Some $367 billion in defense offsets will be incurred between 2010 and 2020, according to Avascent forecasts. This offset-sourced technical knowledge may also create emerging competitors in key markets such as space, tactical aircraft and air defense networks. This trend extends beyond “big ticket” programs like F-35. For a diverse set of product and service areas, markets like Saudi Arabia and UAE in the Gulf, South Korea, Japan, and Taiwan in Asia, and key “Five Eyes” allies like the UK and Australia have all grown in importance to US defense firms and have all increased focus on domestic defense industrial base capability. In a decade characterized by intense competition for new-start programs and increasing personnel and O&M costs, many US defense firms count these markets on par or even more important than the US for certain portfolio lines. This puts greater importance upon strengthening government security cooperation relationships with US allies who have a track record of acquiring advanced capabilities – as well as sustainment services from American contractors. Though the Trump Administration is expected to introduce a fiscal-year 2018 budget that proposes a welcome hike in defense spending targeting shipbuilding, military end strength and nuclear modernization, companies may not benefit from scaling back pursuit of international opportunities in favor of focusing solely on domestic growth. The military Services’ commitment to increasing readiness, as well as addressing unpaid bills for high-priority programs such as the Columbia-class submarine, means that increases in domestic budgets may not be sufficient to offset the need for robust international sales for many US contractors. Additionally, lessons learned by industry working with international partners demonstrate that an enduring commitment to foreign markets is time and time again a key for success. An established local presence and reliable partnerships provide business-relevant insights, access and situational awareness and build trust. If US companies step back from global markets, even temporarily, they are likely to find it far harder to return. With international markets remaining critical to the US defense industry, firms must evaluate the opportunities and risks associated with the Trump Administration’s potential shifts in security cooperation relationships. Despite remarks casting doubt on the US commitment to NATO and other partners, the thrust of President Trump’s public pronouncements appear to be economic, not strategic. Aligned with broader themes of self-defense, job creation, and acquisition affordability, Trump appears to envision a world in which the US can do less because its partners contribute more (economically and operationally) to their own military security. The current refrain should not be a complete surprise on the Continent as American officials have long delivered the same message before, albeit in a different manner. Equipping partner nations via expanded exports of US defense equipment is a logical strategy for simultaneously upholding existing security cooperation partnerships, avoiding over-commitment of US assets in expensive overseas operations, and providing the US direct economic benefits. Partner use of US defense equipment increases interoperability with US forces, multiplying the operational and deterrent value of joint capabilities. Defense firms will likely find Mattis to be a key ally in supporting this long-standing argument. To that end, several European countries recently announced plans to increase defense spending, though at least in Germany, efforts were initiated before Trump’s call for NATO allies to pay their fair share. For US defense industry, there may be industry opportunities associated with the new security cooperation environment in which allies must dig deeper than they have in years in order to fill any national capability shortfalls brought on by the new Administration’s policy shifts. In Europe, this increase in spending will likely focus on key enablers like refueling and airlift, in which currently readiness levels lag other assets. Other product line winners may include ground vehicle assets and intelligence, ISR, and personnel deployments. In Asia, investments will focus on bolstering missile defense and maritime capabilities. While these developments should create opportunity, there are real challenges for US suppliers. The uncertainty surrounding US treaty commitments in Europe, the Asia-Pacific, and the Middle East may lead international customers looking to diversify defense equipment supply chains to open new conversations with aggressive alternative suppliers in China or elsewhere. China’s near-success selling HQ-9 air-defense systems to Turkey in 2015 foreshadows Beijing’s desire to supply its own military equipment directly into the NATO alliance. Technology transfer may also become, paradoxically, a more important factor in defense deals if unpredictable US military commitments fuel a desire to accelerate national defense programs by building up local industry at the expense of importing. This may be particularly true in markets like South Korea that have developed solid technological foundations from years of tech transfer and offset programs. Compared to “outsourcing” production of major subsystems, technology transfers could prove more palatable in the current political environment, even if they create longer term challenges. Even in low growth markets, governments may change their buying preferences, maintaining budgets while searching out new suppliers. For capabilities historically sourced from US defense industry, such as tactical aircraft, these governments could look to new providers that are otherwise more affordable and offer increased technology sharing arrangements. Other foreign governments may simply maintain the status quo- upholding spending levels and sustaining buying behavior that typically advantages US industry. Such markets likely include countries with highly aligned doctrine but less mature domestic industries, like Australia, which has large-scale, established plans for sophisticated air and missile defense and other programs, which will likely involve US industry. The one certainty is that emerging security cooperation doctrine will unfold differently across different markets, generating unequal impact on US defense firms’ country positioning. US firms must assess how they can best realign their portfolios, while evaluating how to leverage and mitigate Administration polices, to sustain and grow their international revenue. A business strategy that can offset risks from a reset of historic defense relationships while capturing potential opportunities should be approached on two fronts: 1) Messaging to US Executive/DoD leadership to shape their advocacy and 2) Reviewing global business portfolios. Given its focus on US economic gains, the Trump Administration may be more receptive to taking a proactive approach to supporting international sales of US defense equipment and services. US defense firms would certainly welcome a more proactive stance. Avascent’s executive surveys consistently reveal a view that US government advocacy for global sales has been ineffective. US contractors should articulate clear messages to the Administration that will enable maximum, positive impact of this advocacy. Simultaneously, defense firms must assess how shifting security cooperation policies will drive or reduce demand across international markets. Jon Barney oversees strategy, consulting, and M&A engagements for Avascent’s aerospace, defense, government services, and technology clients worldwide. His areas of focus have included international strategy expansion, offsets, innovation and adjacent market strategies, and growth through M&A. Prior to joining Avascent, Jon served as an Executive Director in Russell Reynolds Associates’ Aviation, Aerospace and Defense Practice. Jon has been has been a frequent speaker on business strategy at venues such as the World Economic Forum, The Aspen Institute, and Renaissance Weekend and has been published in the Harvard Business Review. He has served as a Board member of the Harvard Business School Club of Washington, DC and is a member of the Economic Club of Washington, DC. He served on the Aerospace & Defense Advisory Board of Fairholme Capital Management. For more information, contact: jbarney@avascent.com. James Tinsley is a Managing Director at Avascent, providing a wide range of management and strategy consulting support to domestic and international defense and security firms with a focus on major defense platforms and subsystems such as weapons and electronics. His expertise and nearly 15 years of experience in the aerospace and defense sector helps clients address a range of needs, from market entry strategies and Price-to-Win to competitive positioning and mergers and acquisitions. Prior to joining Avascent, Jim worked at Jane’s Information Group in their publishing and consulting groups. For more information, contact: jtinsley@avascent.com. August Cole is the writer-in-residence at Avascent. For more information, contact acole@avascent.com. Kelleigh Bilms is an Associate at Avascent focused on providing strategy and capture support to defense platform and sub-system providers. For more information, contact kbilms@avascent.com. Avascent is the leading independent strategy and management consulting firm for government-driven markets, with more than 30 years’ experience supporting corporate leaders, investors and government stakeholders in the aerospace, defence, security, and public services markets. Our growing presence in London, Paris, Warsaw, Ottawa, and Washington DC, combined with our worldwide network of partners, reflects our clients’ distinct needs. We operate in highly integrated teams within and across borders, united by a shared set of values and commitment to serving our clients.